Chapter 1"The Stakes in Seattle"
Chapter 2 "Opening Markets More"
Chapter 3 "Finally Time for Agriculture"
Chapter 4 "Second Crack at Services"
Chapter 6 "The E-Commerce Juggernaut"
Chapter 7 "Disciplining Subsidies and Antidumping"
Chapter 8 "The Return of the MAI"
Chapter 9 "Protecting Intellectual Property"
Chapter 11 "Greening the Rules"
Chapter 12 "Integrating Labour Standards"
Chapter 14 "Joining the Club"
"This is a very useful summary and analysis of the major issues before the World Trade Organization and deserves to be widely read." Michael Moore, Director General WTO in a letter to the authors dated November 11, 1999. 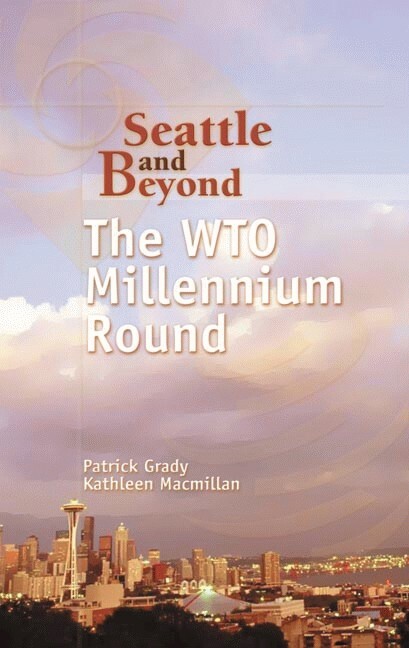 “A useful guide to the can be found in Seattle and Beyond: The WTO Millennium Round by Patrick Grady and Kathleen Macmillan of Ottawa-based Global Economics Ltd.” David Crane, Toronto Star, November 17, 1999. “Canada will therefore continue to fight a long rearguard action against what it purports to favour: liberalized trade in agricultural products. It’s a losing game, but one Canada continues to play. Patrick Grady and Kathleen Macmillan, two respected trade experts, correctly explained why the game is being played in a monograph published on the eve of the Seattle meeting.” Jeffrey Simpson, Globe and Mail, December 1, 1999. "This book is a worthwhile read. It does an excellent job of bringing the reader up to speed with the current state of freeness of world trade. What's more, it is written in a non-technical way, making it accessible to both economists and non-economists. Lastly, it brings some balance to a debate that has been dominated by the media hogging anti-trade protestors who arguably know very little about economics." Bob Duggan, Canadian Business Economics, February 2000, p.62. Buy here for $12 USD including shipping and handling and save.